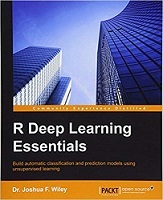 Get everything you need to know to enter the world of deep learning when it comes to R with this download. This quick title offers you the essentials every developer needs to get started - from the packages you need to have for your side, building models related to neural networks, prediction, and deep prediction, to fine tuning and optimizing everything you have. It’s time to see what Deep Learning is like with R! This book will introduce you to the deep learning package H2O with R and help you understand the concepts of deep learning. We will start by setting up important deep learning packages available in R and then move towards building models related to neural networks, prediction, and deep prediction, all of this with the help of real-life examples. Dr. Joshua F. Wiley is a lecturer at Monash University and a senior partner at Elkhart Group Limited, a statistical consultancy. He earned his PhD from the University of California, Los Angeles. He develops or codevelops a number of R packages including varian, a package to conduct Bayesian scale-location structural equation models, and MplusAutomation, a popular package that links R to the commercial Mplus software.